Are calls for service originating from the same neighborhood about the same problem? If so, why? How can work crews respond more efficiently to service calls? Does citizen satisfaction with city services vary across the community? The opening section explains what GIS is and how it works for government. The next two sections describe, through examples from jurisdictions large and small, how GIS is used to support policy decisions and streamline government operations. The final section tells elected officials what they need to do to support the creation of their own GIS programs. 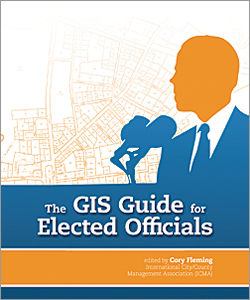 The use cases in The GIS Guide for Elected Officials address the many and varied challenges facing government, from assessing potential markets for start-up businesses to responding to disasters to identifying urban food deserts. Elected officials can learn how to build and maintain a strong GIS program while dealing with rapidly changing technology and shrinking government budgets.